A few days ago, there was a small chihuahua-mix pup running around near the big kid's school. Apparently it had been running around all day (and in the middle of summer in the desert, that's just not good for a little pup! ), and I was able to catch her before school got out. I went over to ask my neighbor a few questions (she works in a vet's office), the doggie got out of my hands and ran across a high-traffic road (unscathed, thankfully!) and my neighbor caught her. She volunteered to take the dog home so that she could take it into the office to be checked out. The next day, I was told the vet said the pup was fine. So I started to try to plant the idea of taking her in Mr. Goats' mind. He's not a fan of small dogs (he doesn't MIND them, but he doesn't want one. He wants a dog that he can wrestle with and put his weight on) so I knew it was a stretch.. but Baby Goats liked the pup! The day after that, my neighbor said that her friend was going to take the dog. I think my little attempt at saying we should get a new dog took root in Mr. Goats' mind, and the FOLLOWING night, we got Perseus (Percy). This so-totally-adorable-rottweiler/blue heeler-mix is only 6 weeks old, so very high maintenance. And he needs a crate.. I'm sure you guys have noticed that I haven't built anything since mid-July, right? Seriously. I haven't built anything in almost 2 months. I followed these plans, but instead of using a project panel for the top, I'm going to use some beautiful Purebond to match the ply on the sides. Oh my gosh, how I love puppies!!! Percy is absolutely gorgeous. I, too, never was a fan of small dogs or ankle biters as I called them. 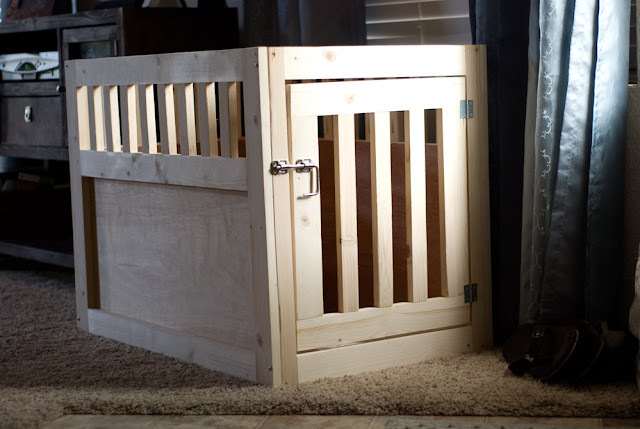 Then I saw a post on Ana's site of a doll bed that included one tiny Maltese. It was love at first sight. I now have a small dog (my hubby felt like yours.) He's a Maltipoo and has won both of us over and it's like having a forever puppy. He's so adorable!!!! They are high maintenance, but oh, so worth it! Congrats on your new fuzzy son as I call mine. And oh yes, nice build! LOL! The puppy is gorgeous..a nice crate also. I' m happy he didnt get hurt!